The great thing about the tour is that you’re not just learning about history, but you’re having a lot of fun in the process...I would recommend this tour for anyone who’s ever thought that a Segway looks fun (they are) or someone who is looking for a unique way to see the battlefield. This tour would be especially great for anyone dragging reluctant teenagers along for the trip (note that there is a minimum age and weight requirement). In my opinion, I doubt that there is a more fun way to see the Gettysburg Battlefield than on this modern steed. You can travel through the Gettysburg battlefield by car, bus, bike, foot, scooter, carriage and even horse, but one of the most unique and enjoyable ways to traverse through the renowned Civil War site is by Segway. Like a general leading his troops into battle, tour guide Charlie Fennell stands tall on his Segway, snaking through the crowd that mills around an equestrian statue. His group follows on their futuristic two-wheeled vehicles, carefully avoiding bicyclists, motor coach passengers and a pair of locally rented three-wheeled scooters resembling circus clown cars. "On battle's 150th anniversary, Gettysburg braces for tourists"
There are plenty of ways to "do" the Gettysburg Battlefield; in your own car with taped audio-tour or step-on guide, via narrated Park bus, on foot or by bike. But in my opinion, the best way to really understand troop movements, skirmishes and the individual players on a human, sometimes humorous, most times harrowing level is through the wind-on-your-face, out in the elements, "walking tour in fast forward" Segway Tour. "Gettysburg and Hershey, PA: New and Noteworthy Will Still Be There After the 150th Anniversary Crowds Disperse"
There are underground railroad pilgrimages, bus tours, horseback rides, and even helicopter outings. But the Segway tours are perhaps the most awesome way to see Gettysburg. They truly get you "out and about in Gettysburg." Susquehanna Style Magazine, July/Aug 2012, pg 68. The Segway. The peculiar two-wheeled, stand-up "Personal Transporters" have become the darling of environmentalists and adventuresome travelers....A unique and green way to visit the Gettysburg Battlefield is on a Segway. "A Day Away at Gettysburg Segway Tours"
We saw Gettysburg on wheels. After visiting the Cyclorama and getting an overall view of the battle, my wife and I joined six other people on a two-hour Segway tour with a licensed guide who described the various groups and battles via Bluetooth headsets. We were able to see the battlefield almost as the soldiers experienced it. Walking the tour might have been a little better, but for us senior citizens, moving on wheels proved to be a better way to experience it. The only thing missing was the bullets buzzing by. Thanks to those who supervise the park area for permitting the two-wheel battlefield experience. "The Gettysburg Segway Tour is an active and eco-friendly way to explore the battlefield in Gettysburg. Step on the Segway device and cover an impressive amount of the battlefield in a short time. While the park is accessible by car and foot, many tourists dislike the interruption of vehicles or the burden of walking through such a large area. The Segway is an excellent compromise between these two options. Since it doesn’t require gas, the Segway is also friendly to the environment and produces a minimal amount of noise." "Explore the expansive Gettysburg battlefield on wheels with Segway Tours of Gettysburg"
"Fall is the perfect time to see the battlefield the way nature intended. 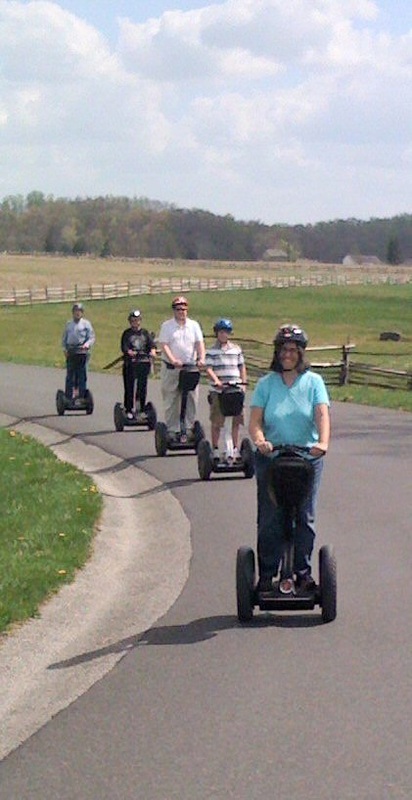 Let Segway be the way you visit Gettysburg -- from a unique and fun perspective." The Gettysburg Experience, October, 2009. "How’s this for a unique adventure? Take something “old” and add something “new” and tour the Gettysburg battlefield by Segway. Segway Tours offers two routes through the Gettysburg battlefield. The Segway Personal Transporter is an environmentally friendly transporter with just two wheels that is self-balancing; you change your direction by shifting your body weight. Lean forward to go forward; lean back to slow down; pull the handle and lean right to turn right; pull he handle and lean left to turn left. Balance your body straight and tall to stop. Sound like fun? It is!" "Take modern spin through Gettysburg"
"Grab your helmet and get ready to travel through time on a Segway! A cool tour in Gettysburg takes you through the historic battlefields from the view of this 2-wheeler. Easy to ride and it is easy on the environment! Start rolling your way through Adams County." "Relive Pennsylvania's Past on the Future of Transportation"
"Riding a Segway across the thousands of acres of battlefield sure beats walking. You wont get tired but the best part is the fun!" "Though I knew I had wheels on the ground, I felt like I was drifting about five inches above it. All I had to do was lean a little and the Segway would magically take me in the direction I indicated, like it was reading my mind. There are thousands of monuments on the battlefield, and traveling around by car cannot give the full experience. "I don't get a chance to see (the monuments) up close in a car," [Dave Eisenhart, Licensed Battefield Guide] commented as we rode past some that were in less accessible locations. He explained that this is a reason that Segway tours of the battlefield are more beneficial in getting a well-rounded view." [The Segway] is not a toy," Velke said. "We're very much focused on the history." They may not be toys but Segways are still fun. "It was incredible," Bill Jones said. "It is almost like a walking tour but not as strenuous. It would have taken us days to see that much." 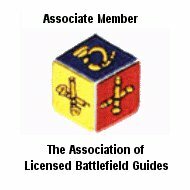 Walking tours are generally too slow and exhaust listeners before getting too far; bus tours are too fast and don't give guides much freedom to address individual interests," [Gary Kross, Licensed Battlefield Guide] said. "This is like my perfect tour."